This is helpful - Thanks. I'd heard of CarbQuik before but never tried it. I see some cookies in my future next year (6 hours away). I am so glad you endorsed this product as I have been a fan of yours since I became a diabetic and used the Carbalose flour which I can buy on-line in the UK Making easy flat breads (like chapatis) to accompany curries and to make a very quick microwave bread made with half carbalose and half ground flax seeds which I eat daily with no ill effects on my blood sugar. I am on my second box of Carbauick. Its great. I'm very glad to hear they removed the soy protein. I hadn't purchased any more because of that, but I will be sure to buy some more now! I'm not sure how this would follow since Carbquick's main ingredient is Carbalose flour. Some more investigation may be in order to find out what the actual count is. Different portion sizes.The Carbquick portion size is 1/3 of that of the flour. They are pretty close when you adjust for portion size. Well yes, I did adjust for portion size. 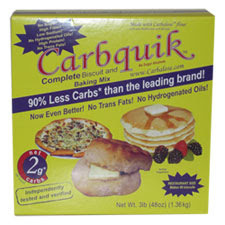 Carbquick is 2 net per 1/3 cup, i.e. 6 per cup. Carbalose flour is 19 per cup. This is as reported on the Netrition website. If you have the actual packages, maybe you can confirm? So you've got about 4 gm more per serving, not a huge difference. The labels are the same in real life as on the site. The mix probably has more oil making up the weight hence less carbs from the flour. You have to remember all those labels are + or - 20% per USDA regs. Except that this is a difference of over 300%. It would not be mathematically possible to add enough oil to Carbalose flour to make a mixture that is 2 net carbs per 1/3 cup, while still having more flour than oil. There must be some other explanation. I may check with the company to see what they say. Is this the same technology they use to make Dreamfields pasta lower in effective carbs? Dreamfields is NOT lower in effective carbs. A study found it raised blood sugar the same amount as regular pasta: Read it HERE. 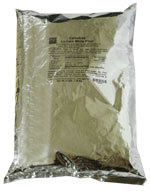 Carbquik is using a mixture of fiber, gluten, and other proteins to achieve its ends. It works well for me which was not the case with Dreamfields. I just had a waffle made out of an egg and Carbquick for breakfast this very morning, topped with locally grown strawberries. Yum! I really love this stuff. The reason I am skeptical is that it is so good. So far I've made pancakes and just used it to make some deep friend eggplant. I am beyond impressed if the nutrition info is correct. When I have tested my blood sugar after eating meals made with CarbQuik I have seen results that suggest the nutritional information is correct as far as carbs go. My one problem with it, however, is that it is full of highly processed palm oil, which I doubt is as safe as the people who sell it want us to believe as there is some research suggesting it has the same negative effect on lipids as transfat does, rather than the positive effect that would be seen if it were really full of monosaturated fat. My guess is that it gets damaged during the many steps of the refining process and contains more trans fat than we realize. It sure tastes like transfat to me. It also contains a bunch of gluten, which gives some people heartburn. I also note that the current label now lists "soy fiber'. That said, using it in reasonable quantities should be fine. I wouldn't make biscuits and pancakes with it every day, but now and then it is probably a nice way to fill a bread craving.